The 1911 platform is a labor of love, and every love relationship has its ups and downs — requiring maintenance. Owning a 1911 brings with it a choice of carry, cleaning, care and feeding. Magazines and ammo make the guns purr, and once you get it right, the whole system will run exactly right. Find the perfect 1911 or 2011 and you’ll fall in love. And just like a perfect relationship — when you know, you know. The Cuda by Simply Rugged is a classic design in leather with modern improvements. The open top makes the draw smooth and re-holstering easy. The high-rise design makes it comfortable to wear on the range or when you carry concealed. The open bottom design allows dirt and debris to slip away. The Cuda goes from the range to the grocery store with ease. The Otis Ultimate LE cleaning kit is an all-inclusive maintenance kit. Included are Ripcord, solid rods, Breech-to-muzzle cleaning equipment and other goodies. Everything is clearly marked, so the set stays organized. Adding to the attractiveness of this new line, a portion of the sales will be donated to the National Law Enforcement Officers Memorial Fund. Thanks, Otis! Real Avid Accu-Grip Picks and Brushes look more like dental tools and less like gun brushes. Included are four brushes, with nylon, bronze phosphor and includes a combination Smart Brush. They’re brilliantly designed to reach every nook and cranny. The material is soft enough not to damage but does the job, unlike conventional toothbrushes. My favorite pairing is this set with the 1911 Micro Tool. The Micro Tool is made of stainless steel, has a flat head screwdriver, rotating pin punch and 1911-barrel bushing wrench. All this on a key ring, so it hangs perfectly on your range bag. Take your 1911, or 2011, to the next level with Crimson Trace’s 1200. The CTS-1200 is a 3.25 MOA aiming reticle packed with easy-to-reach controls. The CTS-1200 is night vision compatible and waterproof. I like it since you can change the battery without removing the red dot. All Crimson Trace red dot sights are covered under the company’s “Free Batteries for Life” program, amazingly enough! The Wilson Combat Elite Tactical Magazine (ETM) 9mm 1911 magazines are tuned for the finicky 9mm single stack. The small front ramp prevents nose-down feeding with short or hollow-point rounds and the steel follower assures flawless slide locks. The observational slots are located in the back of the tube, helping to keep the integrity of the magazine. If you crack one of these magazines (from normal use of course), Wilson will replace it! 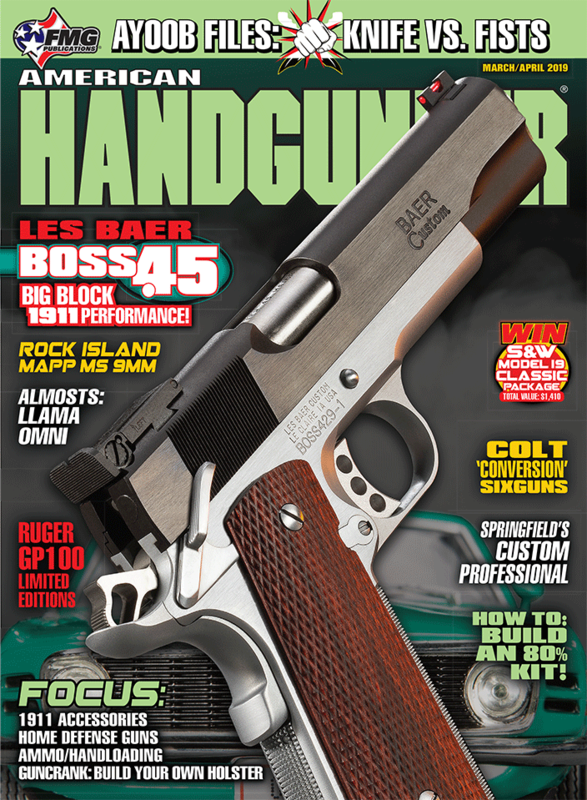 STI makes one of the best 2011 designs on the market — and double-stack magazines to go with them. The STI mag is made of 410 steel, giving it greater strength and corrosion resistance than other magazines. The heavy-duty forming process also allows the STI magazine to reliably hold between 17 and 26 rounds. If you’re into the more “tactical” look, it’s also available in Teflon. Looking for the perfect ammo for your 1911? DoubleTap Ammunition teamed with STI to make a round perfect for the 9mm 1911 and 2011 guns. The collaboration precision-engineered optimal overall length and shape; perfect for the tight tolerances of the 1911 and 2011 guns. DoubleTap has an STI load for any power factor you need for competition. Their ammo meets SAAMI specs — and “gamer” specs. Now you can run a 9mm or 40mm in major! Thanks DoubleTap! Red Nichols is an honest-to-gosh icon in the holster business. From before his days as Bianchi’s chief designer, Red had the “eye” for design. Now, he lives in Australia, doing his best work ever. This “Beat The Devil” model is an “avenger” style and shows the impeccable touches Red is known for. Light, almost feathery, it nonetheless is rugged and virtually perfect for CCW carry. A “must-have” for your best 1911. Pelican’s Vault case line-up is pretty much crushproof, dustproof and weather resistant at every level. Lockable, with stainless hasps, a heavy-duty handle and foam-filled, this top-of-the-line design will coddle and protect your best 1911 babies if the trip is to the range or 5,000 miles away. The word “indestructible” comes to mind here!